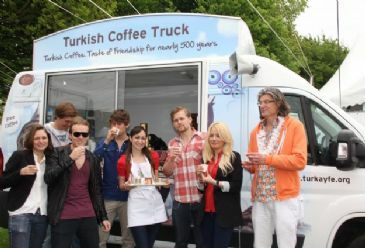 "Mobile Turkish Coffee House" started to fill streets of Europe with the smell of Turkish coffee. AMSTERDAM - After impressing its tasters in the U.S., the "Mobile Turkish Coffee House" aims to reach 10 thousand Europeans during its European tour. World renowned Turkish coffee was promoted at the De Zon Festival in capital Amsterdam where 5 thousand people attended and in the scope of tasting the coffee, long queues were formed. The "Mobile Turkish Coffee House" will head to Brussels and Paris after visiting several other Dutch cities too. Coordinator of the project, Gizem Salcigil White told AA that they were satisfied with the interest of Dutch people into the coffee. Moreover, Tugcem Gaines, who volunteers for the project said, they kicked off the project in the US last year and it kept growing since then. Salcigil stated, their main target was to introduce and promote Turkish coffee and culture and added, 12 thousand people tasted the coffee so far. She underscored, the "Mobile Turkish Coffee House" was a project of Turkish-American young volunteers who dedicated themselves to the promotion of Turkey in the U.S.
Salcigil said, their project was running with assistance of famous Turkish coffee brand, the "Kurukahveci Mehmet Efendi", and that they wanted to take the mobile house to China, Japan and the Middle Eastern countries. Salcigil reminded that the first coffee arrived in Istanbul in 1607 and noted, "In 2017, it would be the 500th anniversary of the coffee coming to Istanbul." Dutch people who queued up for the coffee said, they enjoyed sipping a different blend. Marc Harens stated, "I liked the Turkish coffee. After learning its making process, I will continue drinking it." The coffee house has the motto of "Turkish Coffee-The taste of friendship for 500 years." Well known European universities, the European Parliament and the festival zones will be visited as well.